Although drinking alcohol is against what we as Latter-day-Saints know as the word of wisdom. That doesn’t mean we cant learn important truths from those of other faiths, whose customs might differ from out own. Dr. Michael Foley, the author of Drinking With the Saints: A Sinner’s Guide to a Holy Happy Hour. Writes an insightful book “that contains hundreds of cocktail recipes, distilled spirits, beer, and wine for virtually every occasion on the Catholic liturgical calendar.” It must be pointed out that one of the messages of Dr. Foley book is the importance of moderation, which is a message for people of all walks of life. This book is not about partying and getting drunk. Its about strengthening the bonds between our family and friends. Even though we as LDS do not drink alcohol, we can all be reminded of whats most important in life, and that is our relationships with others. 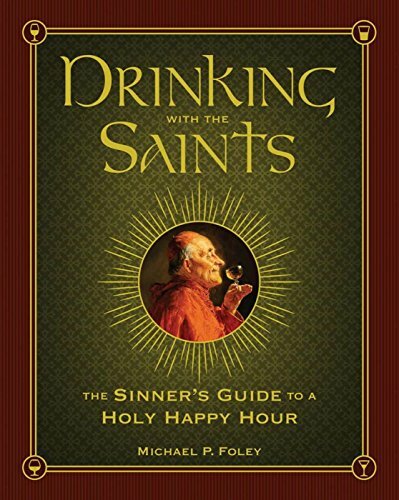 I had the pleasure to sit down and talk to Dr. Michael Foley to discuss his most recent book, Drinking With the Saints: A Sinner’s Guide to a Holy Happy Hour. Dr. Foley holds a doctorate in Catholic systematic theology and is an associate professor of Patristics at Baylor University. Before coming to Baylor, he taught at Boston College and the University of Notre Dame. Foley has published 150 essays and reviews along with publishing several books including, St. Augustine’s Confessions, Why Do Catholics Eat Fish on Friday? other lives happily in unjustly defamed Waco, Texas, with his wife Alexandra and their six children. For those interested in reading more of Dr. Foley’s publications. You can visit his website at http://michaelpfoley.info/. Shaun: I appreciate you taking the time to talk to me about your book. Now obviously your specialty is Catholicism, were you ever thinking of becoming a priest at any time? Michael: Oh it did cross my mind, but I went the way of theology instead which I think was the right call for me. Shaun-One of the books you wrote, is why Do Catholics Eat Fish on Friday? I am from New England, and I heard repeatedly that you eat fish on Friday to support the fisherman. Without spoiling the punch-line of the book, why do Catholics eat fish on Friday? Michael: Well you’re right; there is kind of a punch-line to it because the joke is that Catholics were never require to eat fish on Friday, they weren’t forced to eat fish. What they had to do was abstain from flesh meat. And flesh meat is defined as the meat from a warm-blooded animal. So no beef, chicken, pork, nothing from a warm-blooded animal. The reason is that it’s a form of penance. You’re actually paying a tribute to red meat by abstaining from it because you’re saying this is something yummy and good, but on this weekly anniversary of our Lord’s death, we abstain from this yummy good food. And I think the reason why it’s warm blooded animals that you’re abstaining from, is because in a weird way it’s sort of symbolism by absence; that just as you refrain from eating the flesh of a warm-blooded animal that “died for you”, that sort of paradox then reminds you that this is the day that God died for me. This is the day that God shed his warm blood for me. So you’re sort of abstaining from one thing to remind you of another. Shaun: Is there any truth to the fact that the eating of fish on Friday was to support the fisherman? Michael-Yeah, exactly. For the longest time there was a theory that in the middle ages the church had adopted this practice to bolster the fishing industry at the time. But there actually was a guy, the same year my book came out, complete coincidence, another scholar had wrote a book called Fish on Friday. He was a historian and what he had discovered was actually just the opposite. That it was the Friday penitential practice that came first and it started much earlier in the church, like in the third or fourth century and it was the fishing industry that came after. It’s not that the church was bolstering the fishing industry because of fish lobbyist. It was the demand for fish that started the fishing industry in the middle ages. And he says that, he argues that, that actually lead to the discovery of the New World because the increasing demand for fish pushed the Europeans further west looking for fishing waters and that early navigational efforts to do this were assidually studied by Christopher Columbus when he made his preparations to push west. Shaun: That’s a great insight! Michael: Yeah, there’s always just a money grab with fish lobbyist, but the truth is just more interesting. Shaun: Well let’s dive into your book. I love the title. Drinking with the Saints: The Sinners Guide to a Holy Happy Hour. Tell us how you came up with that title? At the same time, can you tell us what led you to write this book? Michael: Sure. Well my family and I, we’re a catholic family. We’ve got six kids. And we really enjoy following the traditional customs of the church year. And there’s a long list of you know, foods and certain festivities that you can do to honor certain feasts and saint’s days. And as we did this, it occurred to me, are there special drinks that can go with the various feast day of the year. And I found that there were a few, but not a lot. So from this I thought that we needed to sort of round this out a bit, so I went online and discovered that there are hundreds of catholic cookbooks, but never in the history of publication were there ever any bartenders guide. So I thought, ‘well this is a hole that really needs to be sorely filled’. So that’s where the book idea came from. Shaun: When you refer to traditional customs, you’re referring to practices or sacraments that aren’t necessarily sanctioned by the Catholic Church. But that are widely excepted among Catholics. Is that right? Michael: Yeah, exactly. So, folk customs. So these are things that, especially different ethnicities, or different regions would come up with different ways to celebrate the lachurgical year. So on the feast of St. Patrick, you would have corned beef and cabbage, or in a particular region of Italy on so-and-so’s feast day you would have a special kind of pasta. So there are hundreds of thousands of these organically developed customs around the world as a way of punctuating or observing that liturgical year. And a lot of these have been collected into cookbooks and whatnot and so we would kind of consult these and try to make a certain dish for a certain feast day. But one thing is that when you have six kids, and we also homeschool, at the end of the day you’re pretty exhausted and preparing a cocktail for a saint is a lot easier than preparing a big meal. We found that it was a nice way of doing a bit of a shortcut. Shaun: Since it is so central to your book? Could you take a moment to explain what the liturgical calendar is? I am sure there are a handful reading this that are not familiar. Michael: Yeah. It is… yeah… what is a good definition of that? The liturgy is the worship of the church, and that worship consists of not only the Sundays of the year, but other holy days of the year-such as Christmas, Easter, Pentecost. Then you also have what we call the birthday of the saints and by that we don’t mean the date that the saint was born. We refer to their heavenly birthday; the day that they enter into the glory of heaven. So usually the anniversary of the saint’s death is commemorated as a feast day in the church. There are a couple of reasons for this, theologically. It is a way of honoring Christ and his saints. We Catholics don’t worship the saints instead of Christ, we celebrate the memory of the saints because their lives reflected a beautiful Christian life. So there’s a good sort of theology around honoring the saints-remembering the saints-there’s also a good psychological reason for this. St. Ambrose is a very early church father and he was very blunt about this. He said, “God gave us the liturgical year to relieve man’s boredom.” And it’s true that when you can punctuate the year with these various celebrations, there’s just more texture to daily life. Shaun– it was really fun going through the book and look to see what Saint and drink were associated with a given day. I was surprised to learn that there are several days through out the calendar year that was not assigned a saint. Like my birthday, September 4th. Is there any particular reason why some dates are not assigned any saints? Michael-I understand. Well, it gets tricky because there is the universal calendar, which the Roman church follows, but then there can also be local saints that local regions-local deices-added to the calendar. So, St. Patrick’s Day is a huge day for the Irish and Irish Americans; I’m not even sure though if St. Patrick is on the universal calendar. I’m not sure they are required to remember him in Africa, for example. So you’ve got that one contrast right there and the other thing is, not all of the saints-there are probably over 10,000 Canaanite saints in the catholic church. Shaun– Who would have known! Michael-Not every single one of them is represented with a feast. So not every day of the year is filled up with a saint’s feast day, there are blank days on the universal calendar. And what I try to do with the book is, at the very least, stagger things, so I try to have a saint at least every two days. I didn’t always make it, but the goal is to have a saint at least every two days. I didn’t always make it, but the goal for that is the catholic calendar has the same reckoning of time as the Hebrew bible, and the Hebrew bible, if you read the book of Genesis, the day actually begins the evening before. And it was evening and morning the first day. So you can actually start celebrating a saint’s feast day the night before on the vigil of the feast. Like Christmas Eve, you can start celebrating the night before. So by staggering every-other-day, you almost do have a drink suggestion for every day of the year. Shaun: I hate to digress for a moment, but the title of the book surprised me; just how. I didn’t realize how much drinking is a part of Catholicism. To be clear, you repeat several times in the book that we are to drink in moderation, and you also make clear that we should be respectful of those who choose not to drink. Now, the title of the book intrigued me because of how Protestantism views alcohol. I just assumed other Christians, like Catholics would view it the same way. Which I guess explains my conundrum about Friar Tuck in Robin Hood. Michael-Yeah, that’s right and it is certainly no requirement in Catholicism that you have to enjoy alcohol. But by the same token, one of our seven sacraments is, the matter that is used in the sacrament is wine. So alcohol is a starting point for one of the church’s most important sacraments, the euchres. At the very least, the means that we recognize alcohol as a temporal good, as a part of God’s creation, which can be used well, in moderation. Shaun: What I gather from reading in your book, is that drinking alcohol (in moderation of course) actually helps people connect on a more intimate, whether its friends or family. Moderate drinking plays an essential role in helping people coming together. The book is not about drinking alcohol; it’s about bringing people together. Michael-Absolutely. I think you’re absolutely right that one of the goals of the book is to encourage moderation. I think that if you slow down and enjoy the flavor profile of the cocktail, it’s going to make you more prone to moderation than immoderation. So one of the goals of the book is moderation, but another goal of the book is fellowship. Getting together with friends and enjoying drinks in moderation can enhance one’s fellowship. Shaun: Tell me what you think about this thought I had while reading your book. An article came to my mind that I read a few years ago that talked about the symbolism of wine in the scriptures, and how it symbolizes redemption and reconciliation with God. Although your book doesn’t focus on this idea primarily. I can see a connection between the symbolism of wine found in the scriptures, and the function of your book to bring people closer together. I bring this up only as an argument for those Christians who are offended by the idea of drinking alcohol in any way. Michael-I think that there is a tie-in sure, that it is interesting that our Lord shows both bread and wine for the Euchres, and both of those ingredients, both of those things, involve ingredients that had to die in order to become what they were. So the grain loses its individual identify and is reborn through the process of becoming bread. The grape loses itself and is sort of born anew as wine. So there is something to that. I don’t think that symbolism is necessarily essential to being able to enjoy alcohol in fellowship and moderation, but that wisdom is definitely there. Shaun-Yeah, and I think that symbolism is important because I think that the protestants forget the idea of the role drinking play in bringing people together. Michael-That’s true. And I think what’s interesting about that is, I’m actually teaching at Baylor University which is a Baptist university, it has a dry campus, and there is a certain group among southern Baptists that… especially there’s a certain suspicion about alcohol. What’s interesting though is that historically in a reformation, the early reformers did not have this attitude towards alcohol. Both Luther and Calvin drank. Luther use to play drinking games. And the puritans, we refer to a certain skiddishness about alcohol as puritanical, but that’s kind of unfair to the puritans. They brewed and drank their own beer. They didn’t have the attitude that later generations of American Protestants would take on. So the temperance movement as part of Protestantism is a relatively recent innovation. It’s a 19th century American thing. The earlier generations of reformers did not have that attitude at all. Shaun– That’s a good piece of historical facts that I think is very important. Speaking of which, I tried to do as much research as I could with your book. I came across a couple of things that I thought worth bringing up. In regards to alcoholism among practicing religious folks like Jews. There is little alcoholism rate among these groups. It’s when they become secular that alcohol problems arise. Does the same pattern of alcoholism exist with Catholics? Given the fact that alcohol plays pretty central feature with your customs. Is it similar to Judaism? Michael-I really think so, in the sense that when you are brought up with the idea of alcohol as just a normal part of life, and not some kind of forbidden fruit that becomes a symbol of rebellion, when you do that, it encourages the responsible use of alcohol. The nation with the lowest rate of alcoholism in Europe is Italy. Whereas the United States has an alcoholism rate of about 5.5%, Italy has an alcoholism rate of 0.5%. And that’s not because they’re not drinking. They’re drinking all of the time, but they’re drinking in moderation, they’re pairing their wine with food. It’s just a normal part of a daily ritual of life. And Italians don’t get drunk. Anytime you see someone drunk in the streets of Italy, it’s an American tourist. Shaun-Oh, how funny is that? I guess I shouldn’t say it’s funny. Shaun– There’s probably about two hundred Saints mentioned in your book, I didn’t go through and count everyone, but with you and your family, what are some of the saints that are your favorites? Michael-Well, my personal favorite is St. Augustus. St. Augustus, very influential writer of the early church and I do a lot of my scholarly work on him. So, for his feast day on August 28th, we actually created two cocktails just for him. Shaun-What’s the date on that? Michael-August 28th. We have over three hundred cocktails in the book. Three hundred and fifty cocktails actually in the book. Thirty-eight of them are original recipes and two of those are for St. Augustus. He was a notorious sinner-lived a real riotous life-and then converted and became a famous bishop. So, we had two cocktails for him, one for his sinful past and one for his converted life. Shaun-Oh, how great is that? And that’s something I liked about the book, is you get to learn about so many different Saints and how human were. Or at least that’s how you were able to bring them to light. Like Jerome. He was a pretty grumpy guy, which should give all those people who are, or at least live with a Grumpy person hope. Michael-Yeah. You know, it’s really true and it’s their human elements that endear us to them. And the great thing about the lives of the saints is, one of the sort of take-aways is, if this guy can become a saint, so can I. The saints prove that holiness is possible through every walk of life, in every generation of human history. Shaun-I think Catholics get a hard time for “worshipping saints.” But I think the point you’re making is that the saints are there as a point of reference to help strengthen our faith and give us hope. Michael-Exactly. They show us that holiness is possible. And we turn to them and ask them for help, not as if they were demigods or something, but we turn to the saints and ask for their help just the way we would turn to our fellow Christian in the pew and ask for their help or ask for their prayers. And the reason why we can do that is that thanks to the resurrection, death does not divide the body of Christ. So, the saints aren’t dead. They’re alive in the bosom of God. So I can turn to them in the way that I could turn to any other member of my community and ask for their prayers, and that’s what we do. Shaun-Yeah. And that’s nice. It’s a great thought, just because the idea of connecting friend and family into the next life should inspire all of us. Shaun-It’s good. So you have over, well, actually before we talk about the alcoholic beverages, what other saints would be important for people to be familiar with that may not be there? Michael-You know, it really varies. People have different connections to different saints and, you know, it’s all good. Some people may have a devotion to a saint because they were named after them, or their birthday is on that feast day. Maybe you have a particular occupation and there’s a saint that’s the patron saint of that occupation. There’s all kinds of reasons to have a devotion to a particular saint. Shaun- Take someone like myself that is a Mormon, who are not very familiar with all the Saints. Are there any that we should know about that are not well known outside of Catholicism? Michael-Honestly, none come to mind. Michael-It all just depends on where you are and… yeah I can’t think of any sort of universal, cookie-cutter model saint that would fit all. Shaun– It was a lot of fun reading through the different histories and backgrounds of them all. Shaun– You have hundreds of drinks listed in your book. How did you come up with so many? Michael-And I didn’t even count all of the beer and wine suggestions because they are almost too numerous to do so. Basically, I just scoured various databases and encyclopedia looking for some kind of hook or connection between a saint and a particular kind of alcohol. In some respects, it was easy. For example, in France alone, there are over one hundred and twenty saints that are associated with various bottles of wine. Because the French have all of these different regions and local traditions and such-and-such a saint has leant his name to a particular vineyard or a particular winemaker; so there is a lot of connections between saints and wine. It’s similar between saints and beer. Religious orders made a lot of excellent beer in the middle ages and so you still see various beers made after various saints. So sometimes it was very easy to make connections, and then other times it took a little more digging. I would associate a particular cocktail with a symbol in Christian art that was associated with a particular saint. Shaun-How long did it take you to write this book? Michael-A good year. A solid year of research and another year to sort of refine the first draft. Shaun: How one would use this book? Michael-Well, as I say in the intro, don’t feel compelled to use this book religiously-that is to say, follow it every day and make sure you have the right cocktail every night. You know, use it as the spirit moves you. If there’s a special day coming up and you want to commemorate it, turn to the book and consult it. And if there is nothing on that particular day, as you mentioned I seem to have fallen between the cracks of this particular day, borrow one from a nearby day. Or, another option is to consult the index because there actually are two different calendars in the Catholic Church; a traditional one and a new one that came out after 1970. The book follows the traditional calendar, but there are other dates in the new calendar, so if you look in the index you may find the date you want after all. Shaun-Gotcha, I may have to consult that with my birthday. Michael-Yeah. And we also have an app that, there’s a software app that we had made for I as well that the links for it are available on our website. And you can search by calendar on the app which also makes it very easy. Shaun-Now the website you’re referring to is drinkingwiththesaints.com right? Shaun: I think it would benefit our readers to know what the website is used for. Michael: The website is there to help you use the book more effectively. So there’s a section on frequently asked questions. The app is there, again for you to use the book more effectively. Our ultimate goal is to use the website and the blog and the facebook page, to actually hear back from our readers for, perhaps, future ideas for pairings between cocktails and feast days. In a sense, we want this to be a living, developing thing; not just a closed book so-to-speak. Shaun– Another thing I liked about the book is that it’s interactive. It’s not a one-and-done like people do second and third editions. What do you hope that people get out of this book? Michael-Well, we touched upon some of those ideas already. I hope they gain a deeper appreciation of moderation. I hope they have more ideas for fellowship and festivity. And I do hope that they gain an increased appreciation of the saints and recognize these wonderful role models in our lives. Shaun-And I think that with recognizing the saints, coming from the book as an LDS perspective, the historical aspect of the book is worth reading, in my opinion. Michael-Thank you, I appreciate that. It is a fascinating history. You can learn a lot about the history of the west by just reading about the lives of the saints. Shaun: For example, I loved the story about Peter’s mother. Can you tell that really quickly? I think our readers could get an idea of the fun insights they would learn from your book. Michael-Yeah, well there’s a history of the saints and then there’s the legends of the saints and sometimes the two are a bit different, so. Some colorful legends have arisen over the centuries and this one is particularly hilarious. It’s an Italian legend about St. Peter’s mother, who apparently was a piece of work, and when she died she went to hell. St. Peter begged Jesus to let his mother into heaven and Jesus was saying I’m sorry, she wasn’t terribly good, rules are rules. And Peter eventually remembered that once in her life, his mother had given an onion to a beggar. So, on the basis of this good deed, he took an onion and he lowered it into hell and told her to grab on to the roots, which she immediately did. And as she was being lifted out of hell, some other damned souls saw this and grabbed onto her in the hopes that they would also get into heaven. But because she was such a cranky person, she started squirming and kicking, trying to throw these other souls off, which broke the roots of the onion so she went sort of plunging back down into hell. She was eventually allowed into heaven, but only in the remotest corner where her job was to wash the barrels for the wine. Michael-Yeah. It is definitely colorful, so it was on the basis of that legend for the Feast of St. Peter that I recommend a Gibson martini which, a Gibson is basically a martini but instead of olives for a garnish, you use pearl onions. Shaun: What would a non-Catholic get out of your book? Michael-Well I do think this is a book with ecumenical appeal. Like you mentioned, it has historical interest, and it’s just kind of a fun exercise. It excites the imagination. And I didn’t want this to be a closed canon anyway. The idea is that you’ve seen what I can come up with, now let’s see what you can come up with. Shaun-Now, I don’t want to take any more time. Thank you for taking the time out of your busy schedule to meet with me. The best of luck to you and your book.